As more and more of us live and work in cities, urban forests and trees and the benefits they provide — from filtering the air of harmful pollutants to reducing noise pollution to providing us with shade and places to socialize — become increasingly important. 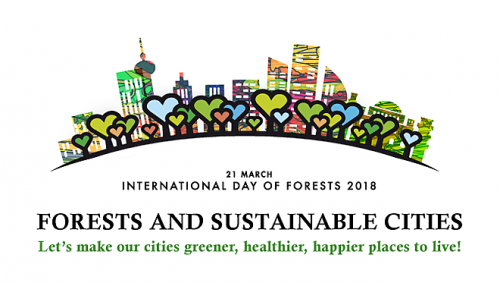 March 21st is International Day of Forests and the theme for 2018 is Forests and Sustainable Cities. To celebrate we’ve compiled some ideas for students to learn how trees make your city a greener, healthier, happier place to live. The Food and Agriculture Organization of the United Nations (FAO) is highlighting the many ways trees and forests support sustainable cities as part of this year’s International Day of Forests campaign. Watch this short International Day of Forests 2018 video and use the following as discussion points with your students. Forests and trees store carbon, which helps mitigate the impacts of climate change. Trees reduce noise pollution as they shield schools and homes from nearby roads and industrial areas. Trees in urban areas can cool the air, reducing air conditioning needs by 30 percent. Forests provide clean freshwater for people by helping to filter and regulate water. Forests also protect watersheds and prevent flooding as they store water in their branches and soil. Urban green spaces, including forests, encourage active and healthy lifestyles. Project Learning Tree’s new Teaching with i-Tree unit includes three hands-on activities that help middle and high school students discover and analyze the many ecosystem services that trees provide. They’ll calculate the dollar value of these benefits using a free, state-of-the-art online tool. Subscribe to our newsletter to receive notice when Teaching with i-Tree is online! In the meantime, for elementary and middle school students, try one of these activities from Project Learning Tree’s PreK-8 guide. In Activity 54—I’d Like to Visit a Place Where…, students develop an understanding of the value of recreational spaces and why these areas are established. In Activity 55—Planning the Ideal Community, students survey the area around their school and plan an ideal community that meets all the needs of its residents. In Activity 4—Neighborhood Design, students formulate ideas for guiding further growth in their communities. In Activity 5—Green Space, students investigate green infrastructure and native plant communities.